Hard Tooling – Combo Dies – AmeriKen Online! The Combo Die, a specialty combination steel rule die, offers unprecedented cutting precision with parts having low tolerance perimeter dimensions and closely spaced internal openings. The die itself integrates the die set, a perimeter steel rule die, and a matched male/female punch. Avoiding the more costly “Class A” tooling process, the Combo Die breakthrough improves accuracy of size and relative positioning among internal cutouts. The material to be cut is fed into the die and the press begins to cycle down. 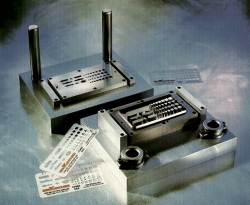 A stripper plate or standard die ejection material holds the material as the inner tooling begins its task. The male die cuts the material and pushes the scrap into the female portion of the die component. Further down the stroke, the outer die cuts onto the female plate. As the press retracts, the diecut part remains in the web with interior cuts having been cut and removed. The Combo tool provides for 100% stripping. The improved accuracy of size and relative positioning among internal cutouts on the Combo Die allows the customer to achieve what could not be done with the usual steel rule die at a cost considerably less than that of “Class A” tooling. 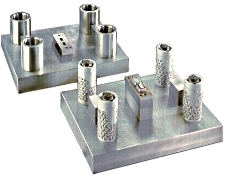 The matched male and female dies are “Class A” tooling, where the male die is a series of solid, hardened steel punches securely mounted in the punch base, with the female die being a hardened steel plate with slightly larger corresponding holes. The use of clearance holes through the female allows for complete internal scrap removal. The perimeter cutout consists of either a steel rule die or a solid machined punch if greater accuracy is required.